Magdalena was one of our original scholarship students and graduated with a degree in Pedagogy from the Universidad Popular de Nicaragua de Managua. 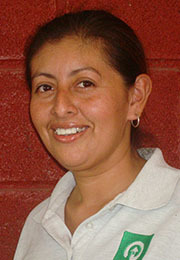 Now, she serves as the Education Teacher for our Tutoring Program, one of Developing Communities’ most valued programs. In this position she coordinates our scholarship students and the tutoring program. She also works on a joint pilot program with the Government of Nicaragua for schools in rural areas as teacher of Language and Literature.